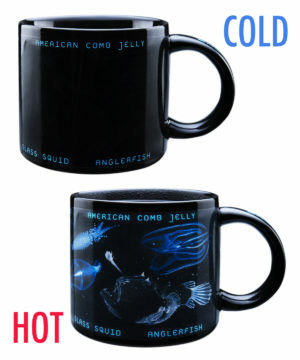 Bioluminescence Mug: Add hot liquid to reveal radiant creatures from the deep. Coffee brings out the best in all of us, even the ocean deep. 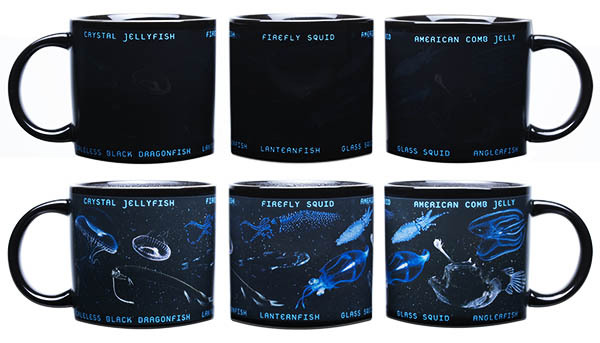 The Bioluminescence Mug’s heat-triggered design features the fascinating creatures that inhabit that strange and dark part of the Earth where few lifeforms dare swim. Pour your hot beverage into the mug and watch as vibrant blue-green creatures begin to emerge from the blackness. Once fully heated, you’ll gaze upon beautiful images of unique deep sea creatures like the anglerfish, the glass squid, the crystal jellyfish, and more. These bioluminescent underwater inhabitants produce an eerie natural glow that allows them to stand out in the deepest parts of the ocean… and on your breakfast table.